“We welcome you with bread – God’s gift to man. We welcome you with salt – a gift from the soil…” – with these traditional words, the participants of the annual North Dakota Ukrainian Festival, Dickinson, ND, welcomed His Eminence Archbishop Daniel of the Western Eparchy of the UOC of the USA. This year’s festival took place on July 20-23, 2017 in Dickinson, ND. Every year the Ukrainian community in North Dakota honors the memory of those who came to settle in the area following the United States government purchase of 827,900 square miles of land as part of the Louisiana Purchase from France. USA President Thomas Jefferson created plans for settling this area with small farms. It was after the Homestead Act was signed into law in 1862 by then President Abraham Lincoln that land was offered at no cost to farmers – “zemlia za durno” – attracting thousands of immigrant and other farmers (homesteaders) to the area and leading to the creation of new states among which was North Dakota (1889). The Ukrainian community of North Dakota opened its heart to the bishop of our Church, who himself immigrated to the USA just 22 years ago. Archbishop Daniel met with the administration of the Ukrainian Cultural Institute in North Dakota, sharing his views of the social, cultural and spiritual development of Ukrainians in Ukraine, USA and throughout the world with the membership. The liturgical services of the Festival weekend included the celebration of the Centennial of Sts. Peter and Paul Ukrainian Orthodox church in Belfield, ND. The parish was organized in 1916 in Ukraina, North Dakota and was constructed in 1917. The church structure, designed by architect Simeon Gulka, was actually physically moved from Ukraina to Belfield. This weekend Liturgy of the 7th Sunday after Pentecost, honoring the life of St Anthony of the Monastery of Kyiv Caves was served by His Eminence Archbishop Daniel, who was assisted by St. Sophia Ukrainian Orthodox Theological Seminary’s students Subdeacon Mykola Zomchak, Ihor Protsak and Yurii Bobko, as well as Oleksiy Khrystych of St. Katherine Ukrainian Orthodox Church in Arden Hills, MN, who assisted seminarians of the Church in prayerful chanting of liturgical responses. Later in the day, upon the invitation of Fr. Yuriy Sas, Archbishop Daniel visited local St. John the Baptist Ukrainian Catholic Church. As Vladyka entered the parish temple, he was greeted with traditional bread and salt and the profound words: “We welcome you with this bread, God’s gift to man. We welcome you with this salt, God’s gift to man through his toil...” These words touched each person in attendance of the Divine Liturgy, as they reflected the painful history of Ukrainians in ND, who labored in the fields of their villages and towns, providing a piece of bread on a table for their children. In his sermon Vladyka Daniel called upon the faithful in attendance to remain true to their Christian vocation, which is being challenged by the world of modernity. 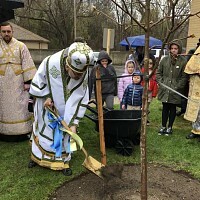 The archbishop stated that being a Ukrainian Christian does not simply mean to dress one in traditional Ukrainian costumes, but it means that one lives his Christian vocation, following the commandments of the Lord while honoring the memory of our forefathers and celebrating 100 years of prayerful ministry. Vladyka asked the faithful not to confuse the past with the present, but to learn from the history of our communities in order to secure a blessed future for generations to come. While partaking in a Centennial Banquet of Sts Peter and Paul Ukrainian Orthodox Mission, the local community recognized the contributions of the oldest parishioner of the Mission – Mrs. Marie Makurak, who remains one of the most active parishioners of the Mission and the entire Dickinson, ND Ukrainian community. Honoring the 100-year legacy of ND Ukrainian Orthodox Mission, seminarians of St. Sophia Seminary presented those in attendance with a gift of several Ukrainian songs. Mrs. Luba Lewytska, a parishioner of St. Katherine Ukrainian Orthodox Church in Arden Hills, MN and co-founder of Very Rev. Fr. 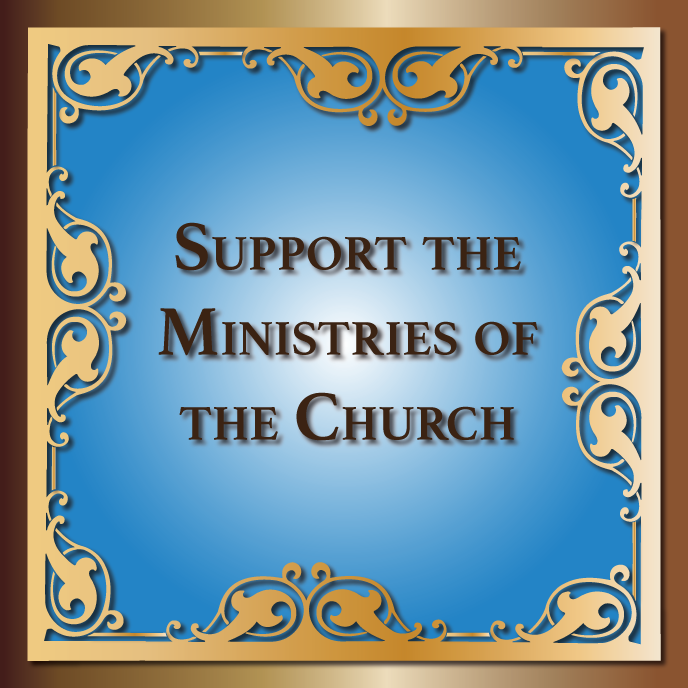 Volodymyr and Pani Lewystky’s Scholarship Fund, shared with the guest of the banquet a spiritually uplifting account of her father’s pastoral service in Belfield, ND, while calling on everyone to contribute to the Scholarship Fund in support of the seminarians of UOC of the USA. Concluding his visit to North Dakota, Vladyka Daniel challenged the visitors, guests and residents of the area to keep the memory of their forefathers alive. It is a daily responsibility to pray for them, because it was through their efforts that the Word of God was kept alive among the faithful of the Church. The archpastor promised to return to North Dakota in the near future. While being delayed in his departure for the Metropolia Center of the Church in NJ, Vladyka Daniel was able to spend several hours in the capitol of the State of North Dakota, while visiting the State Office and the All Veterans Monument dedicated to all North Dakotans who served in the armed forces during the first 100 years of statehood, which was finished and dedicated on June 10, 1989. The names of 4,050 men and women who died in the nation's wars are inscribed on the bronze tablets displayed under a large block of stone supported by columns. It must be noted that several names that are permanently inscribed on the tablets of the monument are of individuals of Ukrainian descent that served in the US Armed Forces.